Need to prepare your site for building? Count on Jeff Fuller Designs. We have the right rigs to get your site work done fast. We can demolish, excavate, and grade your lot to meet your specifications. When you opt to use Jeff Fuller Designs for demolitions and land clearing, you get the whole package. We bring the right tools, the right experience, and expert staff. We can demolish structures on your site, and clear the property of brush and flora. We’ll haul away all rubbish and material from our demo and land clearing. If you’re getting ready to build a new structure, count on Jeff Fuller for demolition and land clearing. We can excavate on your lot to prepare for building. 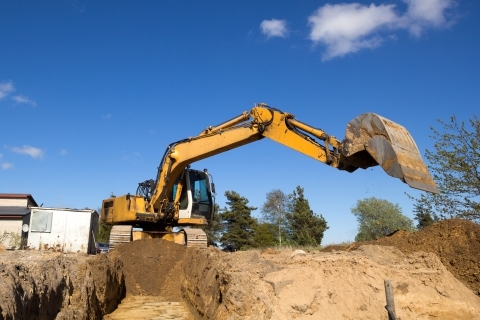 If you’re putting in a basement, a foundation, or a below-grade pool, we can excavate for you. Let us use the right equipment to make your dig a snap. Do you have a lot with an undulating landscape? We can level your landscape to ready it for building. We can grade your landscape so that water properly flows away from any structures to be built on your lot. Without proper lot grading, your structure may be prone to damage caused by pooling water. Are you ready to get your site prepared for your upcoming build? Call on Jeff Fuller Designs. We’re your Jackson- and Memphis-area landscaping company. Get in touch with us today to schedule an appointment! Take note, we offer free quotes!